And this isn’t the first time she has attempted to wipe Israel off the map. 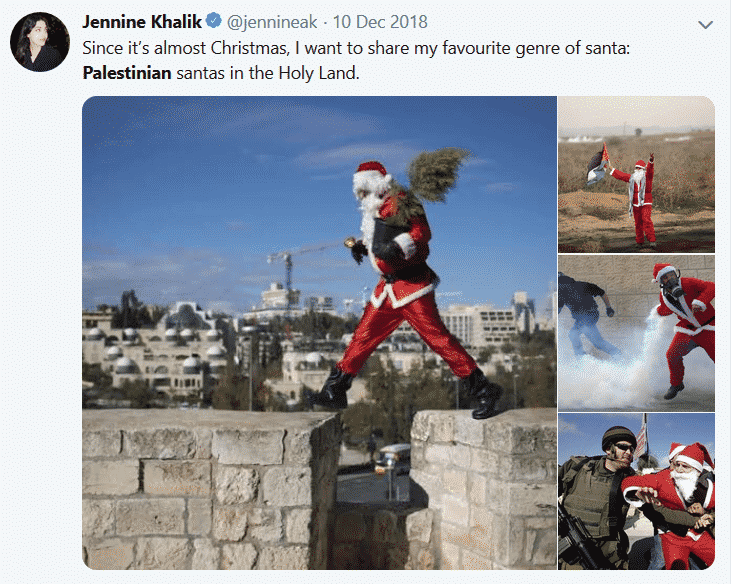 Naturally, she is all for the so-called palestinian “Right of Return”, which would result in Israel’s destruction. And co-opting Christian symbols? Sure, why not! character of the ABC. A democratic society depends on diverse sources of reliable information and contending opinions. A broadcaster operating under statute with public funds is legitimately expected to contribute in ways that may differ from commercial media, which are free to be partial to private interests. Judgements about whether impartiality was achieved in any given circumstances can vary among individuals according to their personal and subjective view of any given matter of contention. diversity of perspectives reflecting a diversity of experiences, presented in a diversity of ways from a diversity of sources, including content created by ABC staff, generated by audiences and commissioned or acquired from external content-makers. • the timeframe within which it would be appropriate for the ABC to provide opportunities for the principal relevant perspectives to be expressed, having regard to the public importance of the matter of contention and the extent to which it is the subject of current debate. 4.3 Do not state or imply that any perspective is the editorial opinion of the ABC. The ABC takes no editorial stance other than its commitment to fundamental democratic principles including the rule of law, freedom of speech and religion, parliamentary democracy and equality of opportunity. As a journalist for ABC Australia, I would have thought Khalik would need to conform to this code of practice. Please join me in lodging a complaint to ABC Australia. I wrote this post because she is a journalist. 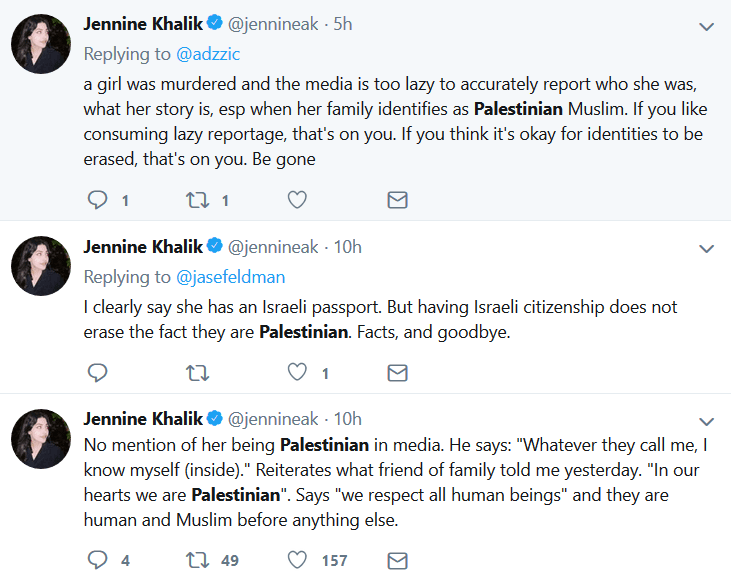 This post has screenshots with her own words; by calling an Israeli-Arab “palestinian”, she absolutely is wiping Israel off the map; and by supporting the right of return of descendants of palestinian Arabs to towns and cities in Israel, she is supporting the destruction of the Jewish state of Israel. I will not be bullied, Jennine. You are not above criticism, so don’t play your identity as a “get out of jail free” card. You erase MY country, and I WILL call you out on it.